If I had followed through with my original brainstorm long before I laid down the granite scraps path, I would have saved myself a ton of time but wouldn't have learned how to tunnel through compacted dirt and rocks to get under a path. I can now say that I know how to tunnel under a sidewalk though so that's something, right? I can explain. You see, the hose bib is, of course, attached to the house and yet the house is on one side of the granite garden path and the garden (that needs to be watered by the hose) is on the other side of the path. We also had an extension cord draped across the path right there because the chicken coop needed a light. It was easy enough to just run the cord from the outlet on the outside of the house right there but it did definitely create a tripping hazard. 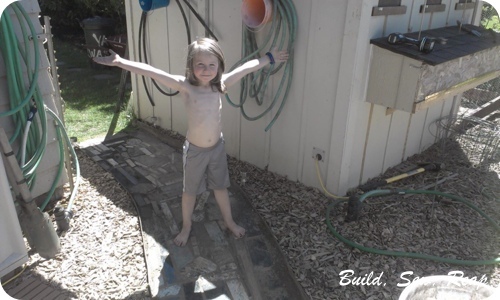 After my husband rolled over the hose with the wagon and ripped the hose timer out of the bib then fixed it and I did the same thing 3 days later, I knew it was time to dig a tunnel under the path, fill it with a sturdy PVC pipe and run the water hose and extension cord through. I didn't even warn the hubs I was going to do it, I just went out and started digging. I totally forgot to take good pictures along the way so I'm stuck sharing phone pictures with you. I can give you some tips in case you ever need to dig your own tunnel. First of all, you'll need to dig a trench perpendicular to whatever you're digging under. This is where you'll lay your pipe/tunnel in order to slide it underneath. 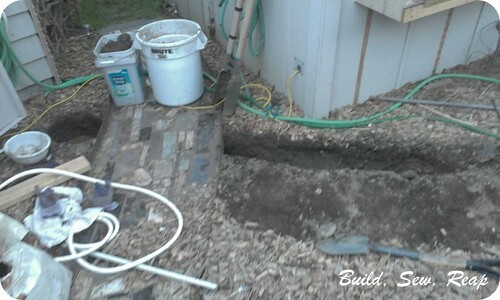 Once I dug out the trench, I started out digging under the path with a garden shovel. That got old really really fast. I then tried hacking at it with the pick ax which also got old fast and the pick is only about 8 inches long so I really didn't get very far. 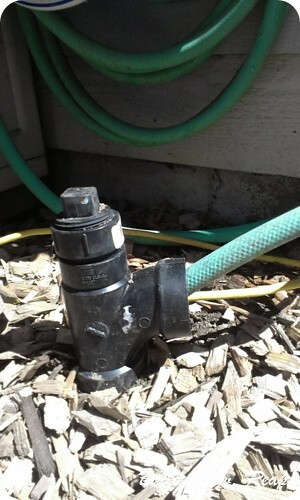 What worked the very best was putting a hard sprayer nozzle on my hose, feeding the hose through the pipe then turning the water on full blast and using the pipe to poke away at the dirt that the water loosened for me. There are lots of youtube videos using a water blaster technique. I can imagine it would have been even faster if I had used a pressure washer but I didn't have one at that time. I did have to stop a couple of times to empty the water out of my trench but that got me most of the way through. Another thing that helped was driving a long piece of rebar through the tunnel-to-be using a sledge hammer then attaching the rebar to my drill and spinning it around. I did that off and on in between blasting the tunnel with water. It seemed to help. That cute shirtless garden gnome appeared while I was working. He's a lousy worker but is very encouraging and appreciates that he can now ride his bike all the way around the house. I buried one length of 2 inch wide PVC pipe then at each end, I added a 90 degree elbow piece and then a "sanitary tee" and the appropriate end pieces to close up the top hole. I wanted a shape that I could feed the hose in but that it wouldn't fill up with water with each rain. The whole setup really works wonderfully. 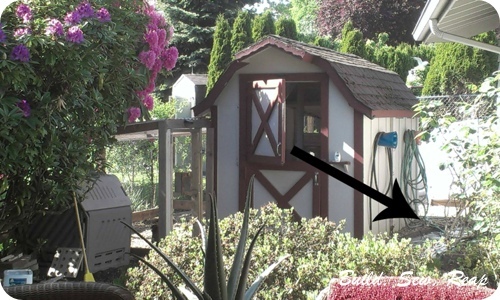 I was able to feed one hose and the extension cord through the pipe so then I set up the watering timer on the other side of the path right next to the corner of the coop, under the nesting boxes. I love not tripping over two hoses and a cord and the Snickerdoodle loves riding his bike up the path, across the grassy back yard, through the side gate, alongside the blueberry bushes, out to the driveway then back up the garden path again.